Series looking at the value of household junk. Karina Warrington is a professional singer and an accomplished collector with a house full of antiques, knick-knacks and furniture. Browse content similar to Warrington. Check below for episodes and series from the same categories and more! Welcome to Cash In The Attic. We search out your hidden treasures and sells them at auction. fortresses in western Europe, the fantastic Caerphilly Castle. The castle was built in the 13th century as a powerful symbol of medieval Anglo-Norman rule. although in 1316 it wasn't enough to stop an army of 10,000 Welshmen trying to capture it. So let's hope we find plenty of items to pull in those pounds at auction. Coming up on today's Cash In The Attic, a house jam-packed with collectibles. There's so much stuff in here. It's like an Aladdin's cave, isn't it? Which way's the antiques? Hmm? That way? You're not interested, are you? And some in-depth auction analysis. Did you see the buyer? He's got very thick glasses. Let's hope we'll all still be smiling when the final hammer falls. This semi in the heart of south Wales is home to professional singer Karina Warrington. having lived in this house for seven years, the rooms are overflowing. But now she's planning to downsize to a smaller property. So, with help from her sister, Catherine, a busy working mum, it's time for a clear-out. Hello, Jules. Mr Jonty, how are you, sir? You've brought me to your next of the woods, haven't you? I certainly have. Wales - always full of surprises. What I've got for you here is a lovely lady, Karina, and her sister who are hoping for a bit of cash. so you may find yourself in front of a karaoke machine a bit later. Karaoke? Bad memories. Well, I can't sing a note, but pound notes, Jonty, that's the order the day. That's your job. So why don't you start having a little rummage round and I'll go and meet the girls? Let's go inside. Hello, you two. Hi. Hello, you must be Karina? I am. Hello, Karina, and Catherine, obviously. That's right, hello. Looking around this place, it's like an Aladdin's cave! Yeah, or Steptoe's back yard, depends how you look at it. It looks like you've emptied every auction house in the county to fill this place up. We've gone a certain way towards it. Now, why have you called in Cash In The Attic? Well, I thought it was time to declutter, because I'm planning on downsizing a bit. So you're thinking of moving home to somewhere a bit smaller? Yes. And you've been roped in to help out with this mammoth task. I have, yes. Just looking around me, there's so much stuff in here. My goodness me. I get the feeling you are a compulsive hoarder? I don't know what makes you think that! And you, I suspect, are the exact opposite. I am. I am the complete opposite. I like space. Are you the ruthless one? Yes. Yes, I think I am. What are you hoping to use the money for? to treat her and myself, so we're planning on a pampering weekend. So a bit of pampering at a spa? Oh, I see! So it's your stuff and your cash and it's your idea. She'd only buy more stuff otherwise, so I'm just saving her from herself. Thank you! How much do you think that's going to set you back? Right, so how much exactly, then? We were hoping for about ?500. 500 quid. Well, there's a lot of stuff in here. but Jonty is man to tell us exactly how much you'll get. He's been having a good look already. Let's go and see what he's found and see if we can get you towards ?500 for a nice girly weekend. Excellent. Super. Yeah? Come on, then. to find it hard to choose which items to part with. 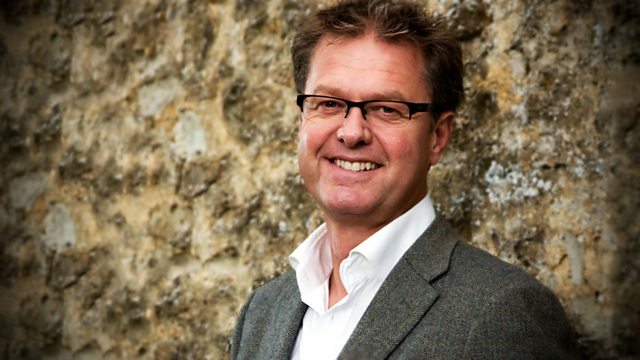 is our very own antiques expert, Jonty Hearnden. Ah...I've found one of your pets! Not just the birds next door squawking away. No, I've got this fabulous bulldog here. You're a bit of a collector. Yes. Well, it's made by Beswick which is a fantastic collecting name. Where do you buy most of your collectibles from? I go to auction a lot. I bought him from an antique fair. OK. Do you remember what you paid for him? I'm not sure if it was about ?20. OK. Well, our bulldog here was issued by the factory right towards the end of its closure. and the great thing about collecting Beswick is the attention to detail. I want to put him to one side, because I've also got some sheep as well. Ah, no surprise being in Wales, Jonty. Well, have a look at the black-faced sheep here. so in 1962 he first came on the market, which will give you some indication about value. Yeah. but I found another little sheep here as well. A little lamb. He was first designed by the big name from Beswick, Arthur Gredington. He was one of their chief designers and he oversaw lots of fantastic work. Again, he was around for 40-odd years. so we've got our bulldog and our three sheep. Put them into one lot and ballpark, sort of, ?50 to ?80 for the collection. That's not bad. The money's being spent already! Yeah! That's all you're concerned about. Never mind the collection, it's what you're gonna get for it, isn't it? That's 50 quid or so. Not a bad start. Good. There's a lot in this house to look through. I've seen. Where shall we go, back this way? OK. Come on. Come on, then. ?50 is a great start to today's search, but with a ?500 target, we've a long way to go yet. so they're keen to roll up their sleeves and get rummaging. lovely little piano stool, which Jonty thinks could bag us ?30 to ?40 at auction. that she thinks Karina should be getting rid of. Hi, what about this? What have you got there? I say. She looks like a rather plump lady carrying a samovar. Do you know what a samovar is? No. It's Russian and it's a container for keeping your liquid warm, often tea. All right. OK, and that's Russian. If we look on the underside here, this is Russian too. Russia itself was under tight Communist rule, so, maybe 20, 30, 40 years ago. That kind of ballpark. It's difficult to say exactly when. Yeah. and that's because the Russians themselves are starting to buy it back. Have you any idea where she bought this? I haven't got a clue, but at a guess probably an auction, knowing Karina! So let's consider value for our rather jolly lady here. Erm... I reckon we're looking at ?40 to ?60, I reckon. Excellent. It's a good little find. Yeah. I'll pop her back down there for safekeeping and we'll go this way. I don't think she's the most attractive lady to have on your mantelpiece. It'll probably be a good one to get rid of out of the house. I think Karina will be more than happy to see the back of her. adding ?40 to ?60 towards today's target. which Jonty estimates at between ?15 and ?25. which is packed off to auction with a ?10 to ?20 price tag. to raise for their spa trip together. Whilst the search continues, I take a few minutes out to find the cause of Karina's auction addiction. Anybody walking into your home is going to know you're something of an antique nut. Yeah. Where did it all begin? and we'd love to get a bargain and Pat was great at restoration so we bought loads of furniture. At one point, we had 11 wardrobes in the house. 11 wardrobes?! Yes. In this house? In this house. Where did you put them all? There were four in the front room at one point. sort of hoarders, we ended up really just keeping most of the furniture. And then when it got too full, we'd put some of it in storage. Yep. And then we'd have more space, so we'd go to more auctions and buy more. Now, tragedy did strike your life, didn't it, a few years ago? that was very sudden and unexpected. Are you going to find it quite difficult to let go of some of these items that you found together? Um, I am certainly attached to quite a few of them. and also I just can't take everything with me, so I do have to be a bit ruthless. The plan is that you are going to move, downsize - are you going to stay in and around Caerphilly? I'm not 100% sure - I wouldn't mind staying either in Caerphilly or on the outskirts. There's a lot going on in Caerphilly. There's good nightlife. it's no surprise that you are a bit of a musician, aren't you? Tell us a bit more about your singing career. I didn't like giving the mic back at the end of the night! and then from there I just went on to do it on my own. And just loved it, really. So, now you're full-time singing? Yeah. That's my job. It's a great job. That's fantastic. I get paid to do something I love doing. That's what everybody wants to do. Have you heard Jonty singing? No. Is he good? Hopefully you'll never get the chance to find out. We could have done a duet! The good thing is, he's around and about rummaging. Let's see if he's found any more to get you and your sister tucked up in a spa. Come on. although our expert seems to have got a little lost. Which way to the antiques? Oh, dear, Jonty. At least Karina's got her eye on the task today. Oh, I say, a little wall clock here, OK. I reckon this was an auction purchase. How did you guess? What it is, Pat always had a bit of a thing for clocks, he liked clocks, so we bought a few from the auction. How many did you buy in all? About a dozen or so. A dozen? OK. And have you still got them all? Most of them, yes. I nearly gave one away but most of them. So this really should go to the auction sale? It really should. Have we got the extra finial along back here, have we got that? I'm not sure if we've got it inside. Oh, we do. That's very good. OK. Here's one I made earlier. Good. OK, Yes. So, that's fine to be able to stick that on there. With that applied down at the bottom there, it's just going to make all the difference to the value. Yeah. your face here would be Roman numerals. And the dial would be enamelled. So again I'm going to look on the inside. And have a look there and, if you run your finger across there, can you feel it's relatively warm? Yes. That should be cold, it should be enamel. so it's probably even late '20s, early 1930s. Can you remember how much you paid for it? time as another clock and we got the pair for around ?28, I think. Wow, you are a magpie around the auction rooms, aren't you? Yeah. That's great because, value-wise, I suppose we're looking at 30, 40, maybe ?50. OK. It's all mounting up, isn't it? It certainly is. Come on, follow me. Thanks. I really like that clock and I do feel a bit sentimental about that because Pat got it working. and it's just going to gather more dust, so it might as well go somewhere useful. That's the attitude, Karina! You're really getting the knack of this decluttering. which he estimates at being between ?20 and ?40. Meanwhile, in the living room, I've spotted a rather intriguing piece of furniture. This is quite an interesting thing - what's this? It's lovely. I think it's an old dentist cabinet. That's what I bought it as. Yeah. And it's got very shallow drawers here which I guess they could have used for their implements of torture! I'm guessing somebody would find this useful around the home. But I wouldn't like to say how much it's worth. The only man who knows that is Jonty, who I think is lurking somewhere. ..Jonty? Jonty, come in here a second. Karina says this is an old dental cabinet. drawers down below to keep all those instruments in. And we've got this big cupboard here. Stuffed full of bits and pieces. There you go. Handy for storage! I better close that up, quick. Full of all your stuff. Well, I can see the handle's been changed. It's moved from that position to there so it has been altered in its time. But if you look at the style, it has a sort of pre-war feel to it. slightly different in style as well. It would fit almost anywhere in anybody's house. OK, Jonty, what sort of value would you place on this? Well, I suppose, ballpark is ?50 to ?80. Maybe more if two people want to fight for it. Would you be happy to put this in the auction? I would, yes. Good, well fingers crossed that will deliver at least 50 quid. And you know what? I'd spend more than that on it. Make me an offer! I think you've got a buyer already! I think that adds to our good start. Plenty more to look at, Jonty. Let's see what else we can find. Let's see what else we can extract. I like it because it's so unusual. But I really haven't got room for all the furniture I've got. So maybe a dentist will find it handy? Put his scalpels in, or whatever they use! The dental cabinet has added a very tasty ?50 to ?80 to our kitty today. and spots this lovely drop-leaf table with barley twist legs in the hallway. Which Jonty thinks could make us ?20 to ?30 at auction. and find out a bit more about her hoard-a-holic sister. Catherine, you're the ordered one in this relationship, aren't you? I think I am, yes! is something that's going to really help Karina move on. Yeah. What kind of a man was he, Pat? He was a wonderful man, Pat was. one of the reasons that she's got all those things around. He used to love restoring and fixing things. and he always had a good story to tell. Brilliant. Tell me about the singing. You accompany her as something of a roadie, is that right? I've been known to be a roadie, lift a couple of heavy speakers, yes! What kind of singer is she? Is she really popular? She's very good, to be honest. She does a mixture of things. country and western she loves as well. She does get the crowd going. She's really good. Very powerful voice she's got. Yeah. we're going to come back with more stuff than we took. It is a potential so I shall try and rein her in while she's there. I'll be the voice of conscience. There is clearly an awful lot of stuff to go through in this house. I don't think there's any time to waste, is there? No. and Jonty has got his eye on one of Karina's collection of wardrobes. What about this wardrobe, what do you think? But it's a little bit narrow for hangers of today, I'd guess. I don't know if they were different before, but it's quite a squash. To get things in you sort of have to push them down a bit. Put in beautifully ironed clothes and they come out looking creased. Well, I bought it from an auction. Don't tell me, an auction? Sorry! It was one of the first auctions that we went to. Myself and Pat. We got some great bargains. Well, this wardrobe was made about 100 years ago. And if you look at the design work, look at all of this. is all replicating Georgian styles. to Georgian designs from the 18th century. So it's their interpretation of that style, of that design. And how much did you pay for it? About ?5. That's outrageous! That's so cheap. I mean, at auction we're not talking a vast amount of money. Ballpark, really, it should be ?40 to ?60. Great. Not bad for a fiver investment. No, it isn't. Good profit. That's the kind of maths I like, Jonty. ?40 to ?60 for the wardrobe is a great find. which I think could get us on to the home stretch for today's search. there is clearly a theme emerging about horses. so I guess that's where the interest started. Jonty, anything of interest here for you? I'm seeing here that they're all Beswick as far as I can see. Is this your collection? You've gathered all this together? They weren't gifts or presents? Really?! Which was your first purchase? The first one I bought was this one. Ah, that's very nice. OK.
That's wonderful. Tell me about her. Cos I know it's a her. Her name is Another Bunch and she was one of a limited edition, I think. There was Warlord, was her stallion, and her foal, Another Star. Do you have Another Star? I do have Another Star, but she's a little bit battered. She's been through the wars. OK. When did you buy Another Bunch? I think it was about seven years ago. and Another Star came out the following year. There are only 1,500 ever made of these. Do you remember how much you paid for this one? ?12. Wow. Because the market today, she's worth in excess of ?50. So you've done very well. Right, yeah! Do you have any ponies or horses with any damage in your collection? Oops! There was nearly another one, there! This one has actually been decapitated at some point. Can you see? Oh, I see, yeah. I glued her together and from a distance, she fits in with the others. From a collecting point of view, there's not much value in our Shire horse here. Have you ever considered their value? Have you ever summed it all up? Not really, no. we're talking, ?400 to ?600 worth of horses. Just for the horse collection? Just for the horse collection. It's fabulous. Would you be happy for all of this lot to go to auction? I would, yes. With the possible exception of Another Bunch. OK. Because she was my first. Right, OK.
We were looking for about ?500 for you girls to go and have a lovely pampering weekend. Without that particular horse, the figure in the order of ?655. another 50 quid perhaps, so nearly ?705. We're going to be the most pampered sisters going! So, I think, quite an interesting collection of stuff, Jonty. Let's see what happens at the auction. We've got a fantastic haul of items to take to auction. valued at between ?50 and ?80. The sheep and dog figurines by Beswick. Again with a combined estimate of between ?50 and ?80. with a massive estimate of between ?350 and ?550. whether Karina decides to bring her very first Beswick horse to auction too. With an estimate of ?50, will she be able to part with it? I'm a calming some pre-sale nerves. If you think you're nervous, he's really nervous cos it'll be his fault! And we're hoping to find homes for all of our lots. You're quite happy to see this go? I'd be very glad to see this go. Will we have reached our target when the final hammer falls? they could sell at auction here in Wrexham. treating her and her sister to a well-earned spa weekend. as we see their items go under the hammer. and I'm hoping the items will attract lots of worthy attention. who's already checking out how our items look in the saleroom. Hey, Jonty. Hi, how are you? All right, mate. How are you? Good, yeah. It looks like some of the stuff from the girls has arrived. Completely empty. Remember how full it was? Looking somewhat decluttered from the other day. Yes, the house was full, to say the very least. Busy is the word I'm going for. Some interesting items here today, not least all those horses. We've got a mixed bag, but you're absolutely right. The horses are the star of the show, the Beswick horses. some people want individual lots, individual model numbers. which allows the buyer to do just that. The big question is, did she bring the star of the horse collection? Another Bunch? Yeah, yeah, that would help. Well, all the stuff's here. Yep. and let's find out, more importantly, if the girls are here! I certainly hope they are, as the bidders are already taking their seats. especially when it comes to Karina and Catherine's collectibles. Hi! Good morning. Morning! How are we today? Fine, thank you. Very excited? Bit nervous. Why are you nervous? In case they don't sell for a huge amount of money! We're going to do so well today! If you think you're nervous, he's really nervous, cos it will be his fault. Have you brought Another Bunch? I have. You have?! Yes. There he is, poking his head out behind us. Took a bit of soul-searching, but my sister talked me into it. You're thinking of spa treatments and massages and stuff! Selfish about it, yeah! We know where you're coming from! Have you seen some of your other stuff lurking around the auction room? Yes. There have been a few people looking at it as well, so that's a good sign. Well, we are heading for a spa weekend, we hope, with your items. Let's get on with the auction, shall we? Excellent! so always check the details with the saleroom first. With a packed house, the auctioneer is in position. Right, good morning, ladies and gentlemen. as our first lot comes under the hammer. so we're hoping there are plenty of collectors in the room. Beswick figure of a bulldog and the Beswick figure of a black-faced sheep. Their estimate is ?50-?80 for those two. Let's hope somebody here thinks they're worth it too. How much for the two? Nice, collectible lot, this. I'll take ?30 for the two of them, then. 20, then? 25, I'm bid. 30? And 5? At ?30, the bid, With you at ?30. I'll take five anywhere else now? 40, and five. At ?45. It's still cheap, that. At ?45. Take 50, anywhere else now? Slowly going, standing at ?45, then. ?5 under estimate. Not bad. Does that bode well or bad for the rest of it? It's watch this space, because you just cannot tell. It really depends who is going to be there. If you notice there were two people bidding. That's all you need to get the price up. about the rest of our lots. Next up is the reproduction jewellery box. The estimate is ?10 to ?20. Let's hope it's at the top end of that. A nice decorative thing, that. Give me ?20 for it. I'll take ?10 to start it. Must be that. Nobody want it at ?10? 15 - she's worth it! ?12 I'm bid. Behind you, there. I'll take 15 anywhere else? Sold and away at 12, then. Ooh! ?12. Well, you've got your money back, yes. I have. ?12 is OVER Jonty's low estimate and the girls seem pleased. when it goes under the hammer next, selling for a really disappointing ?10. Only going to the maiden bid of ten, then. for Karina and Catherine to have that girly spa trip. although even Karina is struggling to see her merits. What inspired you to buy that? I have no idea! You're quite happy to see this go? I will be very glad to see this go! I'll take ?20 to start her, then. Must be that. Nobody want it at ?20? Got to be 20, surely! A cheap-looking lot there at ?20. I'm only bid at ?20. I'll take two anywhere else now. Sold, it's going to the maiden bid of 20, then. That's not sold again, I'm afraid. That's coming home with you again. Oh, no! Still fit in your car, though! You could have had it for 20! I'm very disappointed about that. I'd quite like somebody to have taken her. The bidders are proving to be a tricky crowd and ceramics don't seem to be doing well so far. Will the furniture buyers be any better? Jonty, next up, this small oak table. What did you make of that? Nice, small, compact but, because it's 1920s, there are still a lot of them around. You can't get a vast amount of money for them. But ?30 would be great if possible. Here it comes. Nice little table, that. Lot 88a. Take 20 to go for this? ?20 I've got. Thank you. Right by me. 22? 25? 28? ?32, the bid's with you at the back. 35? 38? 40? And 2? If you like it, sir? At ?40, standing against you now, at ?40. I'll take 5 anywhere else? Sold and away with you, sir. ?40! Great! ?10 over your own estimate. Steady on! Making up for lost ground, I think, probably! Phew! At last something has sold for over its estimate. ?40 is a great price tag for the table, and not before time. Let's see how we've done so far. Well, guys, we're halfway through now. Heading towards, we hope, 500 quid for that luxury spa weekend. How do you think we've done. A bit slow. Slow? I should say so. The grand total at the moment is ?107. So, Jonty, we've a lot of ground to make up. We've got a lot to make up. But I do think the best is yet to come. We've got the rest of the Beswick horse collection. Another Bunch, of course, and that dentist's cabinet. Yeah. Fancy a coffee? Come on, let's take a break. as he hunts out an interesting little lot in the saleroom. Jonty, I love letting you loose because I'm never quite sure what you'll come up with. What are you looking at here? This is a drop-dial clock. It's late 19th century. but it should sell for more and there's a reason for that. You've got the maker and the maker's name here. away from here at all, which means there will be local interest. The dealers will be fighting for this. The casing here is rosewood. And you have lots of nice detail here. So it will restore very well. The actual enamel fascia has seen better days, but this clock still has potential. Let's get back to the auction and see what happens. The second half of the auction is well under way when we get back. It's time for the clock section of the sale. Jonty, you took some interest in. Yes, one of many in your house! It's seen better days, but it is restorable, so I reckon it is a dealer's lot, this one. Let's see how we go. Should be, what, ?30-?40 for that, somebody? I'll take ?20 to start, then. Must be 20?! ?20 is under estimate. It just doesn't seem to be our lucky day. But will the locally-made wall clock that Jonty spotted earlier fare any better? Lot 159. The rosewood case, drop-dial wall clock. Sold and gone at ?80, then? Well, the bidders reached deep into their wallets on that sale. It's just a shame they're not as generous when it comes to ours. Maybe our next lot will have some more success. that's come from your house. Jonty, what do you make of it? I valued it at ?40-?60. Who says antiques are expensive? Real value for money. But there is a flaw to this, isn't there? It's a bit too narrow for clothes hangers. Don't tell anyone in the auction room! Let's see how it goes. Here we go. Good wardrobe. I'll take, what, ?40 to ?50 to go for it, somebody? ?10. Straight in at 10. Who'll say ?12? ?10. I'm only bid at ?10. Take 12 anywhere else now? It's going at the maiden bid of ?10, then. Selling it for a tenner. Good. I won't have to take it home! ?10 is well under estimate and we're short of our target. in the spa is looking further and further away. as the lovely piano stool comes up for sale? We're hoping to raise at least ?30. Under way at 20. I am slightly disappointed that wasn't higher. It's a sweet Victorian pedestal. Cute. Useful in any home. It is. If you have a piano. Or not. and our luck just doesn't seem to be improving. us back on track if we're going to make anything like our target today. So, it's considerably emptier and lighter than when I last saw it. You could tell, could you? You can see inside it now, which is a bonus. ?50 to ?80, but we're struggling a bit today, to be honest. Just a bit. Can we get to 50 quid? Yes, well, who knows? Here goes. Nice, interesting piece. Lot 207A, ?50 for that somebody? I'll take ?20 to start. It must be that. Nobody at ?20? No bid for it. ?20 I've got. Thank you, madam, straight in at 25 I'm bid. 30. If you like it, add 5. At ?30. With you at ?30. 40, and 5. At 40, that's still cheap. Take 5 anywhere else? There's no doubt about it, we're really struggling today. The bidders seem incredibly cautious. I really do feel for Karina and Catherine. even if they can't afford a whole spa weekend. It's a genuine oil painting but it's not to everyone's taste. What inspired you to buy this one? It was cheap. Nobody else wanted it! ?20 I've got. Thank you, sir. Straight in at 20.
Who'll say 2 now? 22, 25, 28. If you like it? At 28, 30, and 2. You're the one laughing now! Take 2 anywhere else now? Away at 30 then. Wow. Well! I eat my hat, Jonty. That's fantastic. Did you see the buyer? He's got very thick glasses. That explains a lot! and we're all pretty relieved, if somewhat surprised. It's time for our star lots now to come under the hammer. will the Beswick horses race us towards the finish line or fall at the first hurdle? This is it, this is crunch time. It's the main event. The Beswick collection. The auctioneer's split these into around about nine lots. With an average of 30 to ?40. They're either in pairs or individuals. So, if we don't do well on this, it'll make the difference between a spa day and a spa weekend. Beswick figure of a Shire horse. ?10 I've got, thank you, sir. In at 10, 12, 15, 18, 20 I'm bid. And 2? Over at the door at 20.
glued back together sells for a fantastic 20 quid. And the next few lots bring home a few pounds as well. But it's far from a smooth ride as the room suddenly goes quiet and the next few lots go unsold. Not sold either I'm afraid. Come to us after. Will Another Bunch perhaps prove to be our lucky charm? This is your fave. Another Bunch. and the girls look really worried. and there's no question that there's a lot riding on this one. Beswick figure of a grey hunter. At ?20, the maiden bid. 30, 32, 35, 38 in the door. That's better. 52, 55? At ?52, the bid is in the door. Sold then at ?52 then. Brilliant! ?52 is a result at last. Just on those nine lots, on the horses, a grand total of ?201. That's a few facials. And I got ?20 for the decapitated, legless Shire horse. So that's not bad. That's the attitude, Karina! have driven a hard bargain but how have we done overall? Well, guys, it's the end of the auction. A bit disappointing, I think, Jonty, in some respects. Particularly all that Beswick. not collectors and that's the reason why we only got the figure we did. 500 quid would get you a spa weekend away which clearly you both do very much deserve. Clearly. but we have got ?428. That's great. Wow! Which isn't bad, given the day we've had. Is that going to be enough? That's going to cover a couple of facials, manicures and a couple of treats. You've been working that out, haven't you? Yeah. I've got the price list at home. Have you, Catherine, managed to stop Karina buying any stuff today? Just about. I've had my hands glued together. Good. Just as well, it means you're going to go away with ?428 in cash for what you intended it for. And an empty boot. An empty boot. take a well-earned trip to their local health spa. It's really nice to be able to spend some time with my sister. She has such a manic life and she has been absolutely brilliant. Whenever I've been feeling a bit miserable, I can always phone her up or visit her. It's nice to be able to do something for her. If you both want come with me, and I'll take you upstairs ready for the therapy. Lovely. to the business of relaxation, via the gift shop, of course. The back massage was so relaxing. It was really nice. You'd never had it before, had you? No. with a slap-up meal. I think I might have converted her a little bit to the facial. The finer things in life. Yeah, you didn't need much converting though. Here is to a lovely day. Thank you very much. Karina Warrington is a professional singer and an accomplished collector. In fact her home in South Wales is so full of antiques, knick-knacks and furniture, there isn't room to swing a cat! Her sister Catherine has begged the Cash in the Attic team to come in and de-clutter.